when in london, one place i always make sure to visit is the massive whole foods on kensington high street. the store really is something to behold—it’s 3 stories high with a bakery, a prepared foods room, and a vegan section the size of my house. as if that wasn’t enough, they’ve opened a branch of saf (an amazing and entirely vegan restaurant) in the food court upstairs. london, i am in love. we hit up saf in whole foods on our most recent uk trip for a light lunch and were quite impressed. 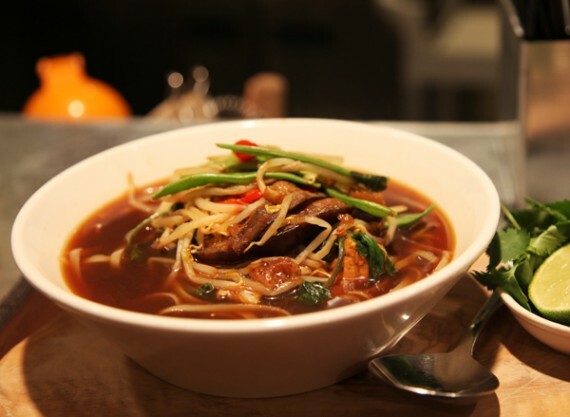 we’d already been fans of the shoreditch location, and the new outlet was just as good. in fact, i totally forgot i was eating in a glorified grocery store. 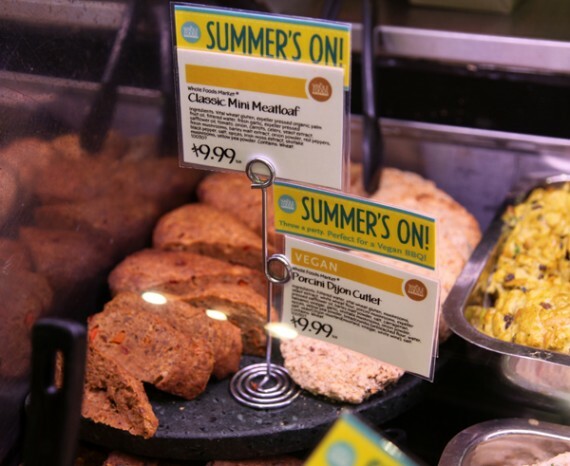 meatless mondays at whole foods in los angeles! we’ve got some pretty exciting news! 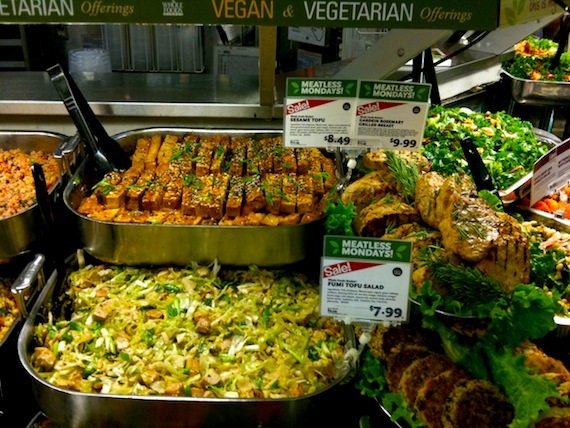 whole foods locations in los angeles have decided to participate in meatless mondays! 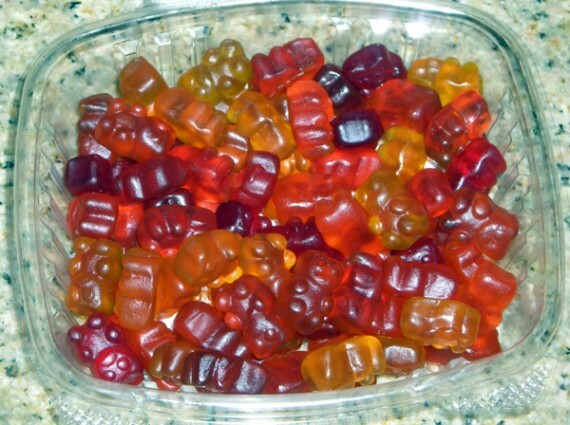 I bought some gummy bears that appeared to have vegan ingredients, but when I tasted them I knew they had to have gelatin as an ingredient. I wrote to Whole Foods Global Office the note below and they responded today that I was correct. If you read my email to them you will see that not only were some of the ingredients missing but the nutritional info area also failed to show the protein correctly. 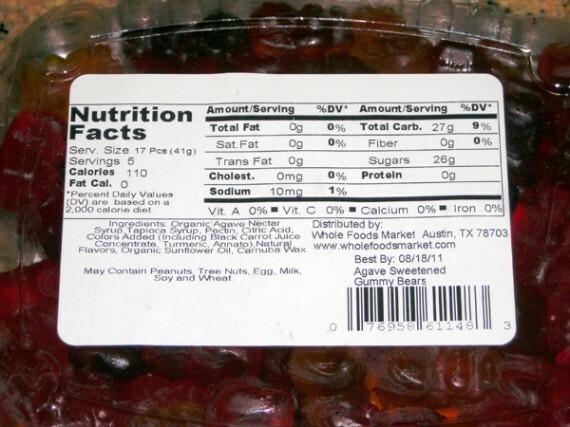 Basically they checked their ingredient listing and it looked o.k., but after more checking with their supplier they found that the label had left out the ingredients Gelatin, Lactic Acid, and Purple Berry Concentrate! vegan treats from isabella’s cookie company! cookie fans, get excited! 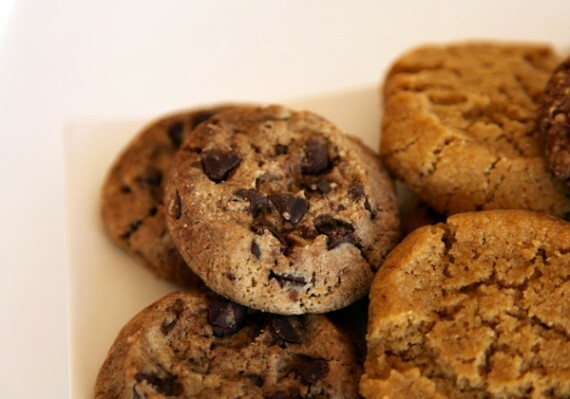 isabella’s cookie company specializes in natural treats (no artificial ingredients or preservatives) and they happen to make four vegan cookie flavors that are available in whole foods locations all over los angeles. vegan curry! 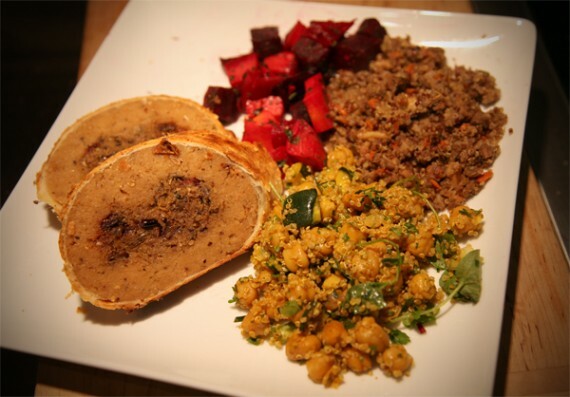 sukhi’s gourmet indian foods! here at QG headquarters, half of our household is british—so naturally, curry plays a huge part in our lives. 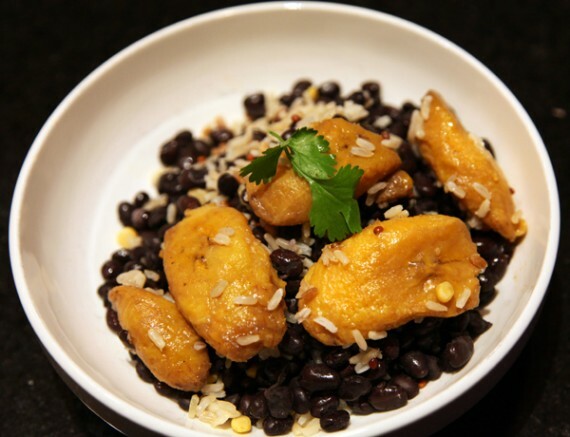 we’ve shared with you our favorite recipe and told you about basu’s homestyle prepared foods…and today, we are giving you a heads up on an awesome vegan-friendly product line that’s available at whole foods: sukhi’s gourmet indian foods. 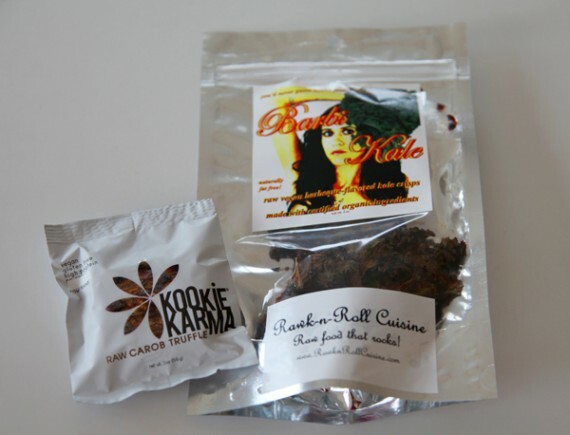 sukhi’s contacted us a while back and offered to send us some of their products for review. always interested in trying new things, we said, “of course!” a couple days later, a package arrived in the mail filled with tasty indian goodies. the first thing we tried was my favorite of all: the naanwich. 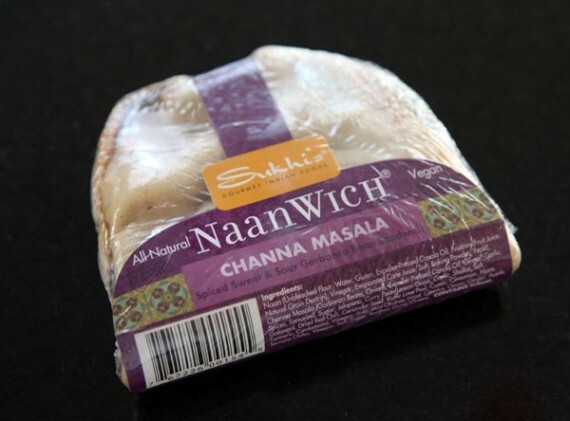 i love naan, i love sandwiches, and i love channa masala…so imagine how excited i was to see all three of those things rolled into one! the naanwich was fantastic. 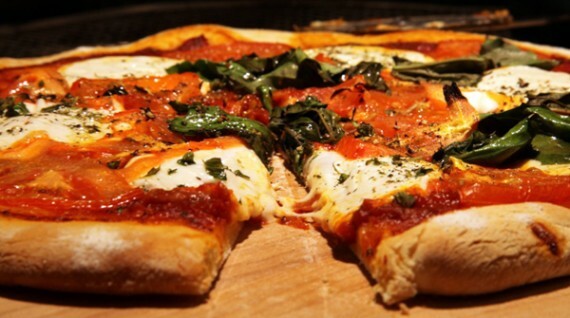 we heated it up in the oven to get it nice and crispy. 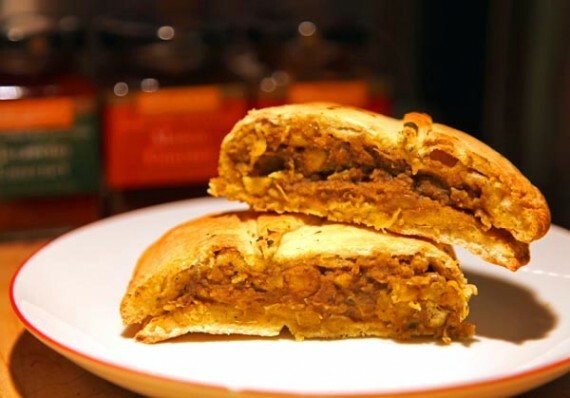 the filling was hearty and deliciously flavored, and the bread was soft and cushy. it was a special treat to have this vegan naan, because nearly every brand of naan bread contains eggs. i’m so happy sukhi’s busted out an animal-free version. 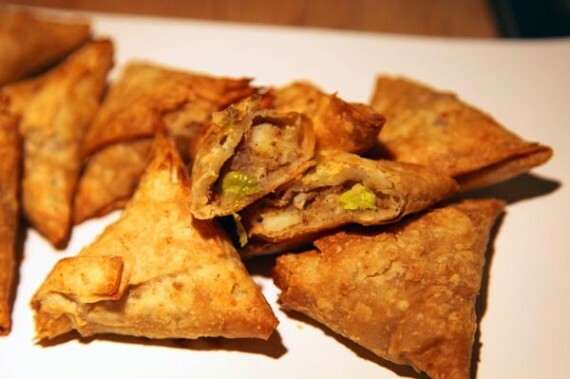 next up, we tried a box of frozen mini samosas. these bite-sized babies were filled up with spiced potatoes and peas, and were gone in no time. seriously, so addictive! they came with a tasty cilantro chutney that was to die for, and we also dipped them in some of the other chutneys sukhi’s sent us: mango, jalapeno, and mango pickle. YUM! 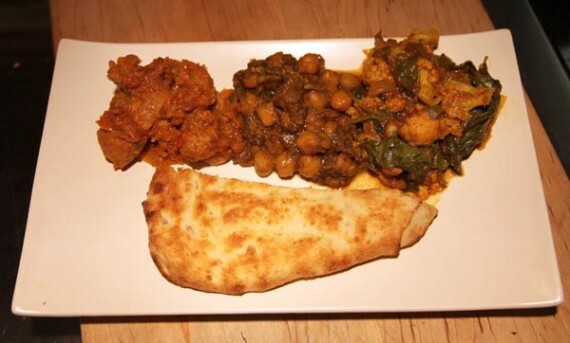 lastly, we tried 2 of sukhi’s frozen vegan entrees—the vegan chili chicken with naan and the channa masala with naan, as well as a cauliflower and spinach curry we made ourselves using sukhi’s vindaloo sauce. it was all fantastic! the only thing i didn’t eat much of was the vegan chicken, because it had bell peppers in it (which i hate). my husband assured me it was great though, and i was a huge fan of the channa masala and the vindaloo. 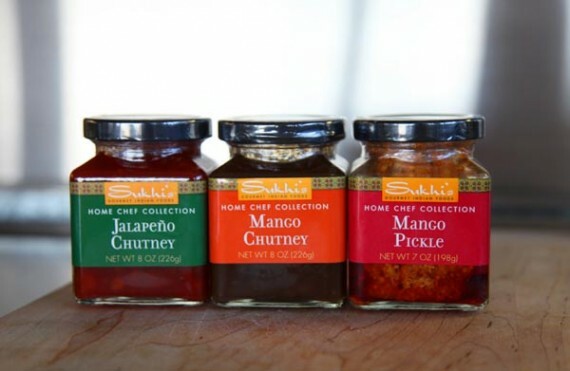 these samples totally won us over, and we have been buying sukhi’s at whole foods ever since. they even have a new low-fat frozen line with vegan options that rock! 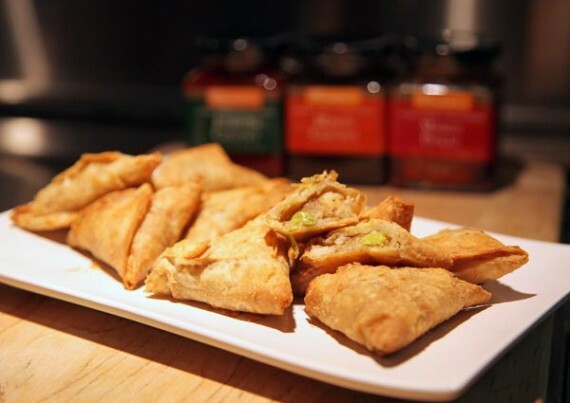 so if you are looking for a quick and tasty indian meal, sukhi’s has gotcha covered. seriously guys, you gotta try the naanwich! for more info on sukhi’s check out their website! 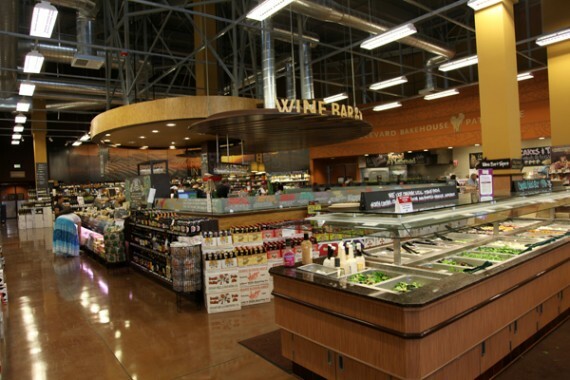 whole foods tarzana: the best whole foods yet. PLUS A CAPTION CONTEST! i shop at whole foods like it’s my job, and i officially have a new favorite location. first i thought it couldn’t get any better than venice, then el segundo took the crown, and now tarzana has got them both beat. it’s massive and it’s epic like no wfs i’ve ever been to before. it needs to be seen to be believed. whole foods update: some vegan brands are back! as of now, select vegan brands like kookie karma, rawk-n-roll, tomberlies, and lydia’s organics appear to be under new distribution and are back on the shelves at whole foods! brands such as a taste of life, rahel’s, euphoria loves rawvolution, and cru are still missing. let’s hope whole foods starts stocking these other brands ASAP. oh, and be sure to check out the back story here. 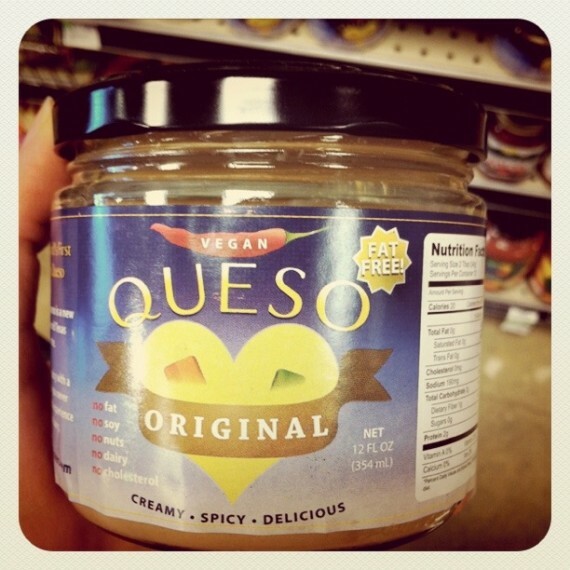 vegan brands pulled from whole foods en masse! 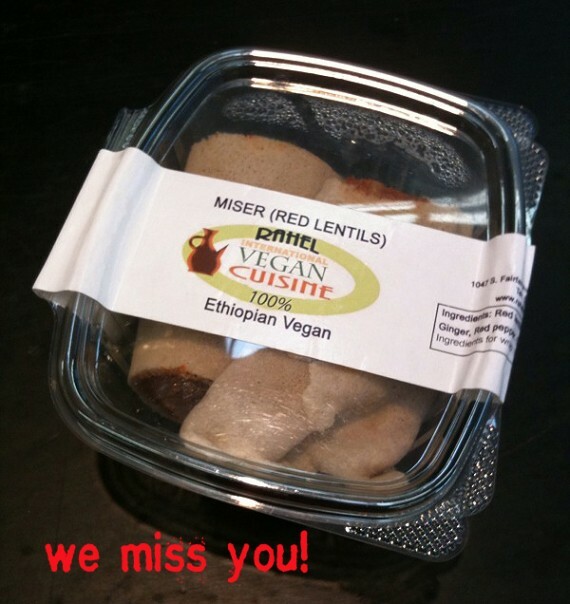 Thank you for your notice about our wonderful vegan foods that were removed from the shelves at Whole Foods. As the owner of Vegan Traders, I must correct one important point that you made in your article. It is easy to see why this mistake was made, since customers have heard from Whole Foods staff that the food was removed due to a Health Dept. recall. In fact it was Whole Foods who decided to remove our food from the shelves, NOT the Health Dept. In our conversations with LA County Dept. of Public Health chiefs Terrance Powell and Angelo Bellomo, they deny any kind of recall or conversation with Whole Foods at that point. They later notified Whole Foods that their investigation of Vegan Traders was completed and we were clear to do business. The recall by Whole Foods was actually an internal decision triggered by a letter I sent to all stores explaining that we were being audited and therefore would not deliver that day (March 26). Please note that all these foods are still available through all our other customer stores. As the sole distributor of these products in Southern California, I hope your readers will seek the products at the numerous independent stores who respect and appreciate our services, and continue to happily sell all the products Whole Foods was carrying and more. 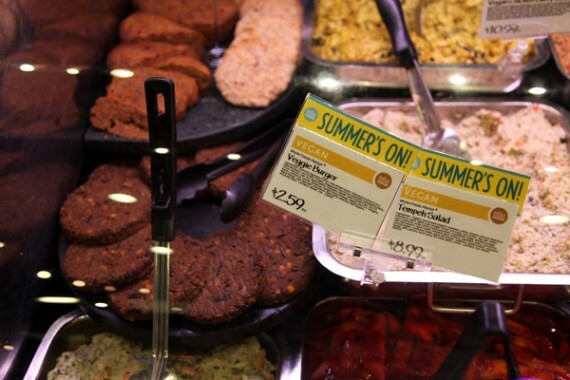 Although Vegan Traders was approved by Whole Foods as a distributor and brought these companies to the shelves, one buyer, one store, one item at a time, over almost two years, Whole Foods insists that now Vegan Traders has no standing. Thus far all the companies remain loyal to Vegan Traders in the hopes that through public pressure and further negotiation with Whole Foods, the decision will be reversed. This decision by Whole Foods to eliminate Vegan Traders and our partner companies from its stores is a puzzling one for everyone. 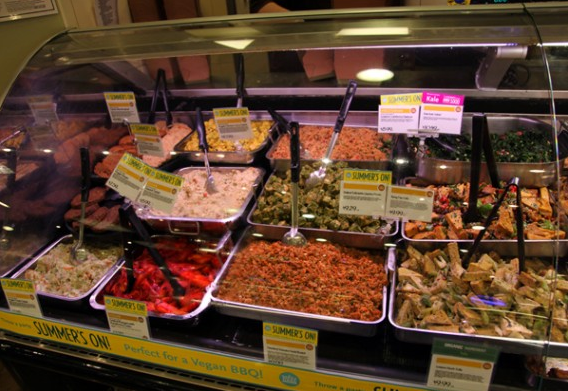 due to some health inspection dramz, and a fundamentally flawed system, it appears as though loads of our favorite packaged vegan and raw foods are now missing from whole foods. apparently, several brands have been distributed to whole foods by a company called vegan traders, which has recently been cited with a health violation. now although these companies never cooked food out of the vegan traders kitchen, nor did they have anything to do with the violation, they are being thrown off the shelves of all whole foods! THIS IS AWFUL! just to name a few—lydia’s organics, michelle’s naturally, rawk-n-roll cuisne, euphoria loves rawvolution, kookie karma, rahel vegan ethiopian, cru, and tomberlies have all been affected. i don’t know if you’ve noticed recently at whole foods…but the store has been rolling out a new initiative called health starts here, which promotes plant-based, low-fat, nutrient-dense cuisine. all the way from the bakery to the deli case, you can find pre-packaged meals to go, branded with the health starts here label. not all of it is vegan, but plenty of it is, so this just means our options at whole foods got a whole lot better. 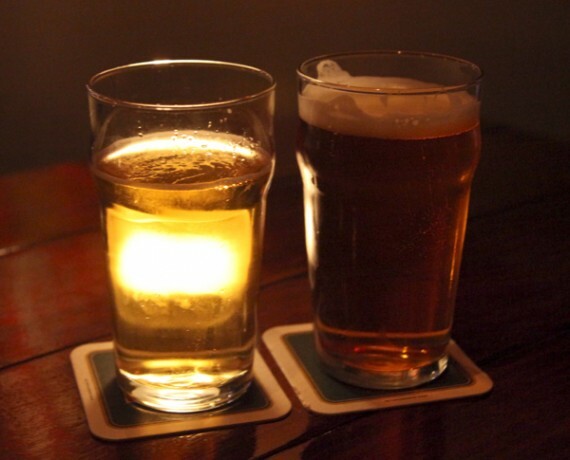 It’s no secret that we’re huge fans here of Verdugo Bar in Glassel Park. From 2008’s Oktoberfest through the summer afternoons of Hot Knives’ Gnosh Pit, several rendezvous with Mandoline Grill, and many late nights under the spell of a DJ, we’ve been through it all, and can’t help but keep going back for more. price drops for earth cafe cheesecake! 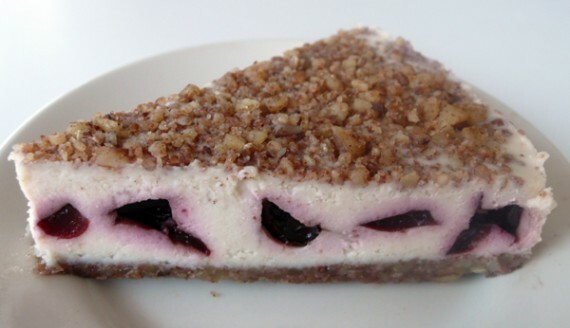 not long ago i wrote a very positive review of earth cafe’s raw vegan cheesecakes and pies, and in the comments section y’all agreed that they were great but bitched about the high price. well guess what, i was at whole foods today and saw that they had dropped the price by 60 cents per slice!! now you can get a slice of one of the best desserts i’ve ever had for just $5.99 at whole foods. seriously, you can’t complain about that price when you take into consideration that this stuff is all raw, vegan, gluten-free and with no refined sugars or hydrogenated oils. this stuff is actually good for you…but it sure doesn’t taste like it. well done, people. obviously The Man was listening to your complaints. maybe other stores will take whole foods’ lead and start dropping prices on vegan shiz as well!